The Twin Elk Lodge condos for sale were a late development at the corner of Ski Hill Road and Park Avenue. It’s next-door neighbor –located right on this corner – was built nearly two decades earlier. Just outside is the bus stop and from here its free transportation directly up to the base of Peak 8. The central supermarket is a block and a half to the north and the gondola, a block closer than that. Twin Elk is a small collection of homes, with a very convenient location. Find out more about these beautiful homes, or check out the current Twin Elk Lodge condominium listings directly below. Just 16 units in 4 small buildings, each of these condos have garages and a basement on the ground level, and two stories of living area above, with covered balconies of the living room and master bedroom. The buildings are heated by hot-water, which is more efficient and less costly in a mountain environment. These condos are smaller than many of these town-home style units built at this time, and are, usually, more affordable. 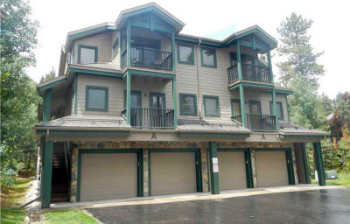 More convenient that parking, the shuttle to the Breckenridge ski area stops just outside of Twin Elk Lodge condos. Town open space trails like the Pense Miller and Hunt Placer historic area are steps away. Downtown Breckenridge begins less than a block downhill since Twin Elk is built slightly uphill of its neighbors, the view of Baldy Mountain and the Blue River valley is very good. Size: 926 sq. ft. to 1269 sq. ft. Amenities: bus stop in front goes directly to Peak 8, on the west edge of town, slightly sloping plat allows for good views of Baldy, skyway and forest neighbors on one side. A one-car garage, and basement that’s double the size of the garage comes with each home, and a hot tub is maintained on the property. From the traffic circle on the north side of Breckenridge exit onto Park Avenue and continue about .5 mile to Ski Hill Road, turn right and take the second right into Twin Elk Lodge; the parking areas are in the center of the four buildings. Do you have any questions about Twin Elk Lodge? Contact us online or give us a call at (970) 453-2200, today! Listing information last updated on April 21st, 2019 at 11:48pm MDT.